Let's get rich! 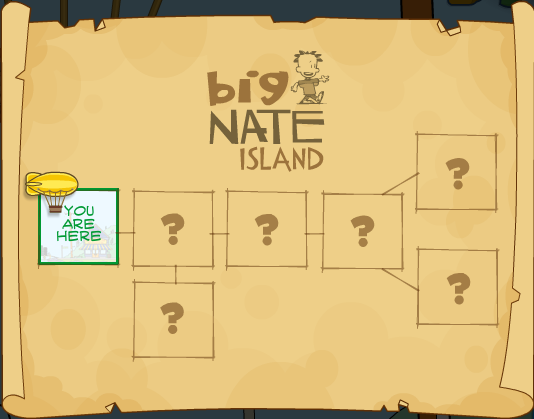 Once you arrive on the island, talk to Nate. Then go right and into the Klassic Komics shop. Go right and talk to Gordie, the owner of the shop and Nate's older sister (Ellen)'s boyfriend. He will give you the title piece of a comic you need to put together. 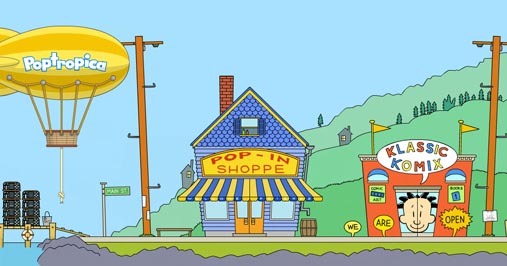 Now leave the store and go left into the Pop-In Shoppe. Go to the top floor, and pick up your first comic piece off the sofa. Exit the building and go right, past the comic shop and Cap'n Salty's. Go into the building shaped like a huge camera and go right. Jump onto the stool, and then pick up another comic piece from the top camera light. Talk to School Picture Guy at the left, and then leave the building. Pretty soon it'll start boiling and releasing a greenish gas into the air. Yuck! A stink bomb! Clog it up and put it in your inventory. Exit the school and climb up the scaffolding to the right of it. Collect the comic piece there. Then go right to the next area, into the playground. Climb up a little and you'll find the seventh piece blowing in the air. It's really not that hard to get it... after you have, go into the "NO TEACHERS ALLOWED" clubhouse at the top of the area. Go left and beat the "Go to Jail" game there. It's just classic Hangman. Nate will give you some dog biscuits as a reward. Hey!!! What a cheapie prize! And you can't even eat it. Don't worry about winning the Table Football game to the left. Just leave the clubhouse. Hooray! Take the finished comic back to Gordie in Klassic Komics and he will reward you with something you can actually eat -- a pack of gum. Wait... is it even edible after all these years??? Why can't you get some decent snacks on this island?! Leave the building now, and into the photo shop. Give School Picture guy (at the left) the old picture you found earlier. He will give you his scuba gear in exchange. Run back to Puffin Point, and after talking to Cap'n Saltly, dive in. You have a limited amount oxygen, so you will have to do this part fast. Unlike Mythology you can't collect oxygen. Just go to the bottom, and make your way left. Collect the trap and wait for your oxygen to run out or swim back to shore. Give the captain his trap, and he will let you have the lobster inside. What the... Hey, food! Wait! Don't eat it yet! Use the keys he gave you to ride the jet ski out to the island you saw earlier. Oh, dang! Big Nate is racing us. What you'll have to do to beat him is, jump at the right time to avoid the obstacles (you click to jump.) You'll have to just time your jump, because if you stay at the very back Nate will beat you for sure. Stay halfway between the middle and very front. Nate is easy to beat; I did it on my first try! Once on the island, get onto the flat rock and push both seals to the very left. Go down and collect the rock wedged in between the rock and island. Now head back to the main island. After studying the map, you probably know what to do. Climb to the top of the lighthouse and use that lobster you desperately wanted to eat earlier to turn the light around and get that pesky seagull out of the way. If you go there you'll find that the clapper of the bell is missing. Darn! Okay, mission over. Wait! I have a way... get into the school and study that comic more closely. Hey, it has a locker code on it! Use it (9305) to get into Nate's locker on the top floor. After you've recovered from that exploding locker, get over there and collect the map revealing the "hidden room." Wait... you'll have to get into the detention room to get to it! Attach the bell clapper, then ring it. You'll see those talkative girls move off the playground. Run over there and drop down a biscuit (so it came in handy after all...) Spitsy the dog will come and dig there. And... what's this? Could it be that treasure??? Well, click on it to find out! Pull it out of the ground, then press the gold button on it to open it and reveal... a GIANT PEARL!!! You're rich! Oh, darn. Those school people are collecting your hard-earned treasure to save some already-doomed school. And Nate's getting all the credit for it!!! Not a very happy ending. Well, you shouldn't be selfish. But... yes! That long-anticipated Island Medallion.